Lodgit Desk’s price administration offers you the possibility to derogate from the standard prices set for your rentable units in the property management for a selected period of time, for example for implementing seasonal prices, trade fair prices, holiday offers, Christmas specials, etc.. The price management can be applied to entire unit categories (single rooms, double rooms, apartments, etc.) but also for individual lodging units. Furthermore, you can define price variants which apply to variable occupations (number of guests). As owner of a number of holiday apartments of various sizes, you can define different prices for each individual unit according to the season. 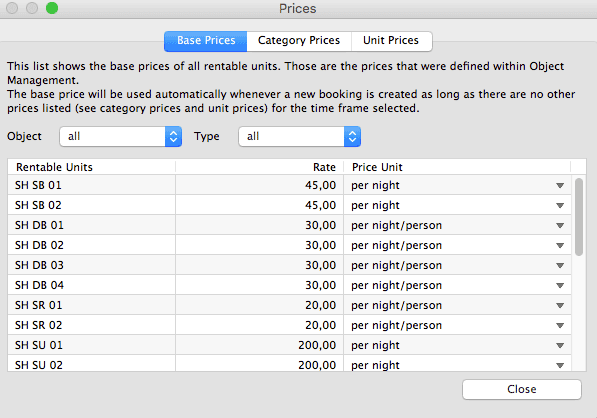 You can also set price variants depending on the occupancy (more than 3 guests, more than 5 guests, etc). 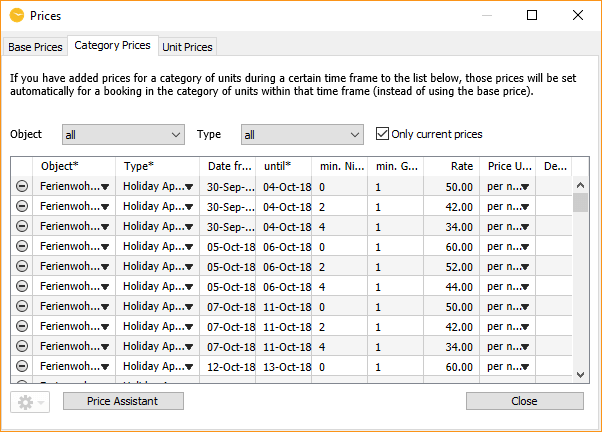 Lodgit Desk computes the occupancy and the date automatically upon booking and calculates the correct seasonal price, which greatly facilitates the making of offers and invoices. Seasonal changes are recognized automatically and correctly calculated by splitting the time frame. As owner of a guest house located in a host city for many trade fairs, you rent out 10 single and 20 double rooms. Especially for the time of a trade fair, you can define category prices for your single and/or your double rooms which are then automatically taken into account in Lodgit Desk when making offers and invoices. 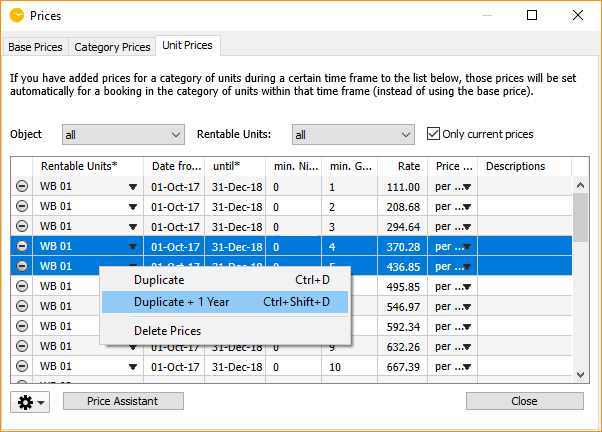 Hint: All data sets from the price administration can be duplicated one year at a time by selecting the command in the right-click pop-up menu, which makes setting up seasonal prices much quicker! View basic rates in the Object Management. Add, view and manage category prices. Duplicate special rates for rentable units.